The full line of absolute encoders Form Encoder Products Co., including those with shaft and blind hollow bores in sizes 36 mm, 58 mm, and standard Size 25 with a 2.5 inch housing now have more communication options and higher resolution. They output of 16 bits for single turn resolution and 43 bits for multi-turn resolution, letting them measure smaller increments giving them longer run-times before reset. They maintain position value without being powered, so if there is rotation during the power-loss and once power is restored, they can transmit the location information immediately. They also offer real-time information with SSI, CANopen, and EtherCAT communication protocol. 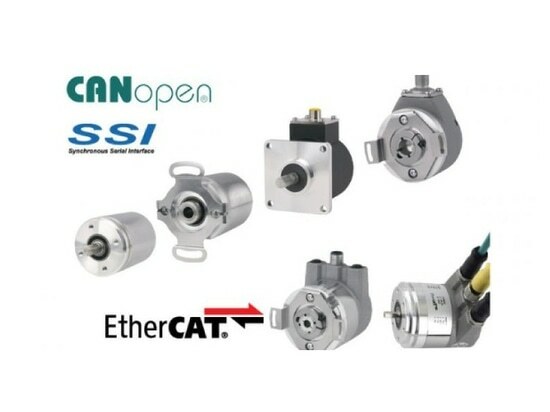 Other features include maintenance-free and environmentally-friendly magnetic design, energy harvesting magnetic multi-turn technology, no gears or batteries, electronic cam switches on CANopen and EtherCAT models, and a compact design with bus cover.